The calm, collected Chief Inspector Armand Gamache stands “still and silent, like the forest itself” as the police search the area deep in the woods of Quebec where the body is found. It’s a cold November morning, and Gamache wonders why a man would come to this spot in the woods to die. He also ponders why the jogger who found the body made no effort to try and help the man. Wouldn’t that be a natural reaction to the discovery? Turns out both the jogger and the hanged man were staying at the nearby Inn and Spa in Three Pines. And Gamache is already leaning toward a verdict of murder. No suicide note is found at the scene, and nothing is found under the victim’s nails. This telltale clue suggests he didn’t climb the tree himself. That is until it turns out the note was indeed written by the victim. Clearly Ellis intended to kill himself, but it would seem someone got to him first. The question is why? Gamache heads into Three Pines to question the locals and learns that Ellis had been making inquiries, suggesting he was looking for a young man. Coincidentally, a young man has shown up at the local bed and breakfast at about the same time. Could this be who Ellis was searching for? The mystery deepens when it turns out Ellis is a pseudonym, and his reason for coming to Three Pines relate to a past tragedy. There’s no doubt “Ellis” was killed prior to being hanged, but who realized they were being hunted and turned hunter? Gamache gathers all the characters (and suspects) at the spa in the final chapters for a Golden Age era reveal of the killer’s identity with an appropriate, if slight twist to the revelation. At times early on, it seems as if the narrative relies on too many expected patterns of human behavior. Particularly in assessing guilt and determining the suicide isn’t a suicide. It’s almost too narrow a world view, but that works here. It’s a cozy throwback to the Golden age mysteries. Cell phones don’t work in Three Pines, the locals have their quirks, and human nature is predictable. It all makes for a satisfying read, and a quick one at that. 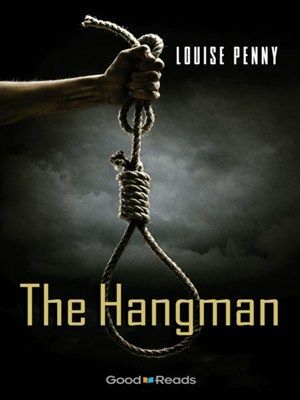 The Hangman, a novella published in 2010, gives readers a taste of Louise Penny’s Three Pines mystery series. Though it’s always more enjoyable to read a series in order, it’s not integral to have done so in order to enjoy this entry. If the name Arthur Ellis seems familiar, you may have heard of the Arthur Ellis Award, an annual award presented by the Crime Writers Association of Canada. The award is named after the pseudonym of Canadian hangman, Arthur B. English, who served as the country’s official executioner from 1912 to 1935. Author Penny won the award for her first novel, Still Life, in 2006,and again in 2011 for Bury Your Dead. The name’s use in the novella is no coincidence and a clever employ.